I would like to thank all the wonderful book reviewers who have taken the time to read The Renegade Queen and respond. What brings me the most joy is that after years of neglect by history, Victoria’s voice is being heard. Thank you! This amazingly good debut novel by Eva Flynn stars Victoria Woodhull, a figure so outrageous and improbable that most of Flynn’s readers will be tempted at first to think she’s an invention of the author. And yet, no! Woodhull, publisher, stockbroker, Suffragette, Communist, and the first female presidential candidate in American history (her running mate was Frederick Douglass), was a very real figure and a regular headline-grabber in the 19th-century United States. As the book progresses, readers become acutely aware of the fact that the “forgotten” part was not an accident: in a delightful twist, the villain of the book turns out to be none other than Susan B. Anthony, who seeks for a variety of reasons to blot Woodhull from history. Going from a dysfunctional household into a miserable first marriage, Victoria Claflin knows first hand what it is like to be abused. Tired of ill treatment, Victoria begins to voice her opinions about free love and divorce whenever she has an opportunity. It’s not until she meets the love of her life, Colonel James Blood, that Victoria makes a real push for women’s rights. The Colonel plays key roles in her attainment of wealth and support in the suffrage movement. Victoria’s viewpoints are undoubtedly radical, and she often gets into arguments with Susan B. Anthony. Yet her determination earns her a nomination for President of the United States in 1872. The tide take a drastic turn, though, when Victoria gets wind of a scandalous affair and decides to make it public. Eva Flynn pens a compelling read on the rebellious life of Victoria Woodhull, a woman who was written “out of history altogether.” The first book in her Rebellious Times series, Flynn’s first person narrative covers Victoria’s life from her meager beginnings up to the time that she leaves for England. Pulling from a plethora of sources, which she lists at the end of her debut, Flynn skillfully weaves history into engaging dialogue while relaying a powerful story of one woman’s fortitude during a time when women had less value than cows. While much of the emphasis is on Victoria’s role in the suffrage movement, Flynn’s plot also centers heavily on Victoria and James’ unique yet short-lived relationship. Flynn keeps her storyline moving by combining chronology with all of the above-mentioned literary elements. Fascinating from beginning to end, The Renegade Queen is certain to be a hit for history enthusiasts. I recently read a book I much anticipated, The Renegade Queen by Eva Flynn, which was about the life of the forgotten American feminist Victoria Woodhull. Even though her voice was strong it has been quieted to the nation, even in history books. It was a little surprising that Woodhull was born in Licking County, Ohio, which is the state in which I reside. I’ve read so much about famous people from Ohio in the 1800s lately, it was interesting to add her to the list. I vaguely remember hearing of Victoria Woodhull in my university history degree pursuits, yet then again in my research when I was looking into a project on the women’s suffrage movement. However, to most people, the author of the book is correct, she’s been highly swept under the rug for the legendary Susan B. Anthony and group to take the limelight as the suffragettes of history. You’ll find out why within the pages of the book. As this novel represents, Woodhull did quite a bit of TRUE campaigning for women’s rights without a care for social etiquette, and not only the right to vote, but the right to marry, divorce, and have children without government interference. Even Anthony and Elizabeth Stanton did not publicly stand for these rights for fear of being chastised. She became a leader for the women’s suffrage movement and took on anyone and anything that stood in her way. First of all, I want to state that this book gave huge insight into Woodhull’s beliefs, motivations, and her determined ways to make women equal in all regards. Flynn showcased how her views and pursuits were similar to the movement, but yet, also how they differed and the way she believed they needed to go about getting the progress they needed. Secondly, Flynn made Woodhull endearing in an empowering way, truly allowing her to shine and progress in our vision. Not only in this matter, but in all things, Flynn did a tremendous amount of research and it carries though the book within her representation of Woodhull. What I didn’t know, or remember, is that Woodhull was the first woman to run for President of the United States in 1872, with Frederick Douglass as her running mate. However, Flynn doesn’t just focus on that part of her life. She takes readers to the very beginning of Woodhull’s life, as a girl, showing us her trauma of a childhood of abuse and neglect, her father using her clairvoyant talents to fool people out of money, and not even allowing them to wear shoes. When her first husband came to take her away after seeing her abuse, he has to buy her from her father, which left a lasting impression on Woodhull especially when that husband turned out to be an alcoholic, a womanizer, and also abusive. It’s important for readers to be drawn into her story, to see where she came from, so that we can better understand her beliefs and what drove her to fight with such an extreme fervor. She was proven to be a woman of survival in this novel, and in that right, Flynn does her a great justice in history. This isn’t only a women’s rights book though, or a story of the first woman to run for President, it is the story of how Woodhull fought for social norms such as the capitalist elite and in favor of the working class. I believe her motivations to point out that an all male political system made up of those with money was corrupt is a point that we are still espousing on to this day. Her voice caused stirs, as anything worth doing should, and many of her methods and suggestions for reform have been implemented. Her drive to care not only for women, but for the poor and the working class, has left a lasting legacy even if most people don’t realize her efforts. As a business woman she and her sister became the first female stockbrokers on Wall Street in 1870 and dubbed “queens of finance.” With their money made, they were some of the first women to found a newspaper as well (now that’s cool too for me, because as a journalist, I’ve been apt to study anything about the history of journalism-I was so intrigued by this) in order to support her candidacy, but it ended up being a place for them to showcase their opinions and alternate views, as well as ideals for labor reform. I could go on repetitively about Woodhull and not even touch the amount of learning that is encased inside Flynn’s book. In fact, a good portion of it pertains to her second husband and their work together, and how their voices put them and their love in harms way. The ending of their story and this book is a bit heart wrenching, however, I don’t feel it would be a spoiler to say that Woodhull is off to England at the end and that I’m much looking forward to Flynn’s second book where she’ll write about this next part of Woodhull’s life. 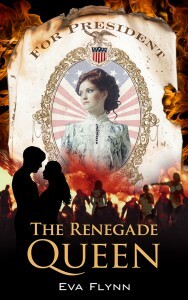 Eloquently written with depth of character, intrigue, and emotion, The Renegade Queen is a book that will entrance you into knowing the woman called Victoria Woodhull. Eva Flynn has done extreme justice for this extraordinary woman in history and will inspire a new nation of women when they read it. Highly recommended for readers and to stock library and school shelves everywhere.– Erin Al-Mehairi, Oh for the Hook of Book!